The Dandenong Ranges is a photographic and historical journey through Melbourne's beautiful Dandenong Ranges, covering interesting places to visit, unique areas of historical significance and forgotten, secret locations as well as private and public gardens. The Dandenong Ranges were explored in the 1850s and are a popular destination for Melbourne people and tourists since the 1900s. The mountains are located 40 kilometres east of Melbourne, and rise to a height of 633 metres above sea-level from the surrounding plains. The rich volcanic soil with high rainfall allows the flora the grow abundantly with magnificent tall forests and lush fern gullies. Agriculture is an important part of the ranges, with many flower, vegetable and berry farms. The Dandenongs contains hundreds of species of flowering plants, tree ferns and exotic plants. There are over 20 species of native animals, 200 birds species as well as numerous types of amphibians, fish and reptiles. The most famous bird to inhabit the Dandenong Ranges is the Superb Lyrebird.There are many attractions including beautiful gardens, walking tracks, forest areas, galleries, restaurants, tea-rooms, quaint villages, guest houses, nurseries and mountain lookouts to explore. 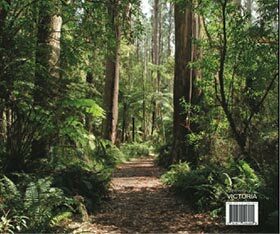 This book captures the beauty of one of Melbourne's important tourist attractions, with award-winning photographs covering all seasons, including wildlife, historical information and inspiring quotations. 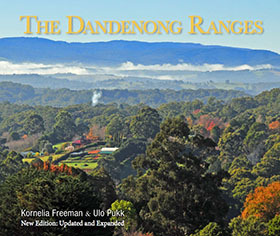 'The Dandenong Ranges' with its colourful, outstanding photographs provides a fascinating view of Melbourne's Dandenong Ranges. 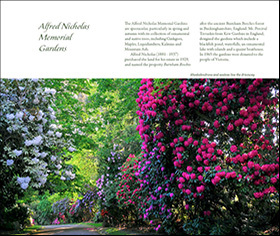 The second edition includes 30 additional pages, updated contents and includes walking tracks and a directory.